You Can Learn More About Careers in the Armed Forces. 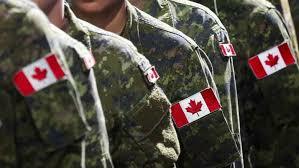 The Canadian Armed Forces will have their mobile recruiting office in Flin Flon this week. Warrant Officer Dylan Lee says they accept applications from any Canadian citizen over the age of 17 with a minimum grade ten education. He explains they’re going to have a military career councilor there and a recruiter and they’ll be able to speak to all of the over 100 careers that are available for people to take up with the Canadian Armed Forces and they’ll be able to advise them on how to put at application in and they’ll even have computer equipment available for people to come in and put an application in for the Canadian Armed Forces. The mobile recruiting office will be in the Walmart parking lot tomorrow from 8 to 12, Wednesday at the air show at the airport and Thursday back at Walmart from noon to 9.